A grassland in the Philippines. An Inner Mongolian grassland in the People's Republic of China. Grasslands are areas where the vegetation is dominated by grasses (Poaceae), however sedge (Cyperaceae) and rush (Juncaceae) families can also be found. Grasslands occur naturally on all continents except Antarctica. Grasslands are found in most ecoregions of the Earth. For example, there are five terrestrial ecoregion classifications (subdivisions) of the temperate grasslands, savannas, and shrublands biome (ecosystem), which is one of eight terrestrial ecozones of the Earth's surface. 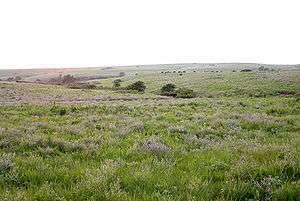 The Konza tallgrass prairie in the Flint Hills of northeastern Kansas. Woody plants, shrubs or trees, may occur on some grasslands – forming savannas, scrubby grassland or semi-wooded grassland, such as the African savannas or the Iberian dehesa. Graminoids are among the most versatile life forms. They became widespread toward the end of the Cretaceous period, and fossilized dinosaur feces (coprolites) have been found containing phytoliths of a variety of grasses that include grasses that are related to modern rice and bamboo. Grasslands often occur in areas with annual precipitation between 600 mm (24 in) and 1,500 mm (59 in) and average mean annual temperatures ranges from −5 and 20 °C (Woodward et al. 2004). However, some grasslands occur in colder (−20 °C) and hotter (30 °C) climatic conditions. Grassland can exist in habitats that are frequently disturbed by grazing or fire, as such disturbance prevents the encroachment of woody species. Species richness is particularly high in grasslands of low soil fertility such as serpentine barrens and calcareous grasslands, where woody encroachment is prevented as low nutrient levels in the soil may inhibit the growth of forest and shrub species. Grasslands dominated by unsown wild-plant communities ("unimproved grasslands") can be called either natural or 'semi-natural' habitats. The majority of grasslands in temperate climates are 'semi-natural'. Although their plant communities are natural, their maintenance depends upon anthropogenic activities such as low-intensity farming, which maintains these grasslands through grazing and cutting regimes. These grasslands contain many species of wild plants – grasses, sedges, rushes and herbs – 25 or more species per square metre is not unusual. Chalk downlands in England can support over 40 species per square metre. In many parts of the world, few examples have escaped agricultural improvement (fertilising, weed killing, ploughing or re-seeding). For example, original North American prairie grasslands or lowland wildflower meadows in the UK are now rare and their associated wild flora equally threatened. Associated with the wild-plant diversity of the "unimproved" grasslands is usually a rich invertebrate fauna; also there are many species of birds that are grassland "specialists", such as the snipe and the great bustard. Agriculturally improved grasslands, which dominate modern intensive agricultural landscapes, are usually poor in wild plant species due to the original diversity of plants having been destroyed by cultivation, the original wild-plant communities having been replaced by sown monocultures of cultivated varieties of grasses and clovers, such as perennial ryegrass and white clover. In many parts of the world "unimproved" grasslands are one of the most threatened types of habitat, and a target for acquisition by wildlife conservation groups or for special grants to landowners who are encouraged to manage them appropriately. Grassland in Cantabria, northern Spain. A restored grassland ecosystem at Morton Arboretum in Illinois. Grassland vegetation often remains dominant in a particular area usually due to grazing, cutting, or natural or manmade fires, all discouraging colonisation by and survival of tree and shrub seedlings. Some of the world's largest expanses of grassland are found in African savanna, and these are maintained by wild herbivores as well as by nomadic pastoralists and their cattle, sheep or goats. Grasslands may occur naturally or as the result of human activity. Grasslands created and maintained by human activity are called anthropogenic grasslands. Hunting peoples around the world often set regular fires to maintain and extend grasslands, and prevent fire-intolerant trees and shrubs from taking hold. 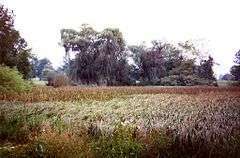 The tallgrass prairies in the U.S. Midwest may have been extended eastward into Illinois, Indiana, and Ohio by human agency. Much grassland in northwest Europe developed after the Neolithic Period, when people gradually cleared the forest to create areas for raising their livestock. The professional study of grasslands falls under the category of Rangeland Management which focuses on ecosystem services associated with the grass-dominated arid and semi-arid rangelands of the world; rangelands account for an estimated 70% of the earths landmass, thus many cultures including those of the United States are indebted to the economics that the worlds grasslands have to offer albeit from producing grazing animals, tourism, ecosystems services such as clean water and air, or from energy extraction. Grassland in the Antelope Valley, California. Similar to montane grasslands, polar Arctic tundra can have grasses, but high soil moisture means that few tundras are grass-dominated today. However, during the Pleistocene ice ages, a polar grassland known as steppe-tundra occupied large areas of the Northern Hemisphere. These are in the tundra biome. 1 2 University of California Museum of Paleontology Grasslands website. Ucmp.berkeley.edu. Retrieved on 2011-12-01. ↑ NASA Earth Observatory webpage. Earthobservatory.nasa.gov. Retrieved on 2011-12-01. ↑ Piperno, D. R.; Sues, HD (2005). "Dinosaurs Dined on Grass". Science. 310 (5751): 1126–8. doi:10.1126/science.1121020. PMID 16293745. ↑ EO Experiments: Grassland Biome. Earthobservatory.nasa.gov. Retrieved on 2011-12-01. ↑ Laycock, W.A. 1979. Introduction, pp. 1-2, in: French. N R. (ed.). Perspectives in Grassland Ecology. Springer, New York, 204 pp., . ↑ University of California – Santa Barbara Temperate Grasslands website. Kids.nceas.ucsb.edu. Retrieved on 2011-12-01. ↑ How can grazing heal land?. ManagingWholes.com. Retrieved on 2011-12-01. French. N R. (ed.). 1979. Perspectives in Grassland Ecology. Springer, New York, 204 pp., .